There are good days and bad, for all of us. For me, sometimes the sunniest ones can feel gloomy and the days with torrential rains can prove to be the most nourishing. Some days are full of broken promises, gnawing anxieties and dread, while others feel like the beginning of something new and exciting. I have friends who, daily, struggle with their marriages or suffer from debilitating conditions, and others who have children, like my son Calvin, with chronic illnesses or behavior problems. I have friends who have lost their jobs, their spouses, their parents or their kids, and some who are struggling just to keep their heads above water in dizzying mires of too much this or not enough that. These hardships, no matter how unjust they might feel, are part of what it is to be human and we have little choice but to wade through the murk, eventually coming out on the other side. But the knowledge that so many precious, innocent black men, women and children are so frequently murdered by white cops and civilians in this so-called great country of ours sickens me. The problem stems from institutions this country was founded on and profited from—racism and slavery—institutions which have eventually morphed into the New Jim Crow, institutions for which we should be ashamed to fly flags in commemoration. We think we live in a nation where our equality is protected by our constitution, but in reality, millions of us, particularly our black and brown brothers and sisters, continue to be systemically targeted, discriminated against and marginalized. African Americans are victims of racism and oppression and are more often subject to discrimination, police brutality and backassward stand-your-ground and voter ID laws. They are arrested and incarcerated at grossly disproportionate rates compared with whites. They’ve suffered the most from jobs sent overseas. They continue to be unjustly targeted in the war on drugs. They were swindled by the thousands in the subprime mortgage crisis. They took the biggest hit in the recession. Their children are unjustly punished in our schools, unjustly sent to detention, unjustly put into prison, unjustly confined to solitary, beaten, tortured, condemned, stripped of their rights and sent to their graves. An entire race of innocent men and boys are labeled by white people as thugs because of the color of their skin or the clothing they choose to wear, even when they themselves are the victims, as in the case of young Trayvon Martin. But when a white man with a racist manifesto guns down nine innocent black people in a church, telling them he has to kill them because they are taking over his country, he's labeled a deranged individual or a druggie and the crime itself is referred to as an accident or an isolated incident or even a war on Christianity. Some of you may wonder why I write often about race in this blog. I do because I see injustices and I want to right them. I write what I’d be telling my eleven-year-old son, Calvin, if he could comprehend. I write because I am white and the battle against racism needs champions of all races for the message to get through to some. I write because I love and value my African American friends and the contributions they make to the betterment of our society. I write because too many white people are ignorant of racism's existence or flatly deny that racism and white privilege exist. I write because too many white people stand their ground and shut their eyes and cover their ears to the realities of racism, preferring to think that it was buried with slavery, while others are intent on placing blame on its victims. If you’d ask me why, I’d say, I’m not sure, but deep down I imagine it’s because we are afraid to face our demons. 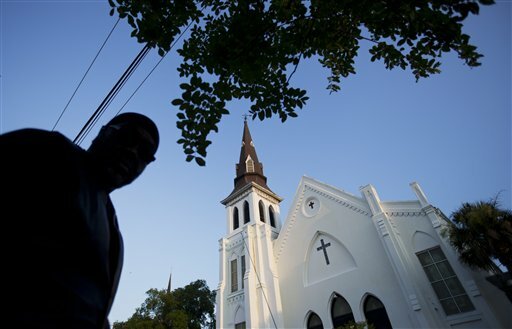 Rather than admit our complicity, some of us would rather glide along as if everything is okay, insisting we are colorblind, as if we don’t need to be accountable for other people’s welfare, as if it’s enough to say that a group of black parishioners were shot by a lone wolf psycho rather than by a white supremacist terrorist with considerable backing. I read Dylann Roof's manifesto until I couldn't anymore. He's got it so incredibly wrong, and he's not the only one. Like anyone, I often feel caught in life's rough seas, at times riding a blue wave of hope and opportunity and at others being sucked into the surge of dread and worry, usually over Calvin, who has chronic epilepsy and suffers a host of other neurological deficits. I can’t change that because he was born that way. But I do what is in my power to make life a little more hospitable for him since he’s victim to so much injustice—though doesn't deserve to be—no matter how unworthy some people might think he is, people like those of Nazi Germany who sent the disabled and the infirm to the gas chambers before sending millions of Jews. Though my son is very ill and compromised, I still consider myself one of the lucky ones. Daily, I benefit from good health. I've benefited from good parenting, a good education and my ability to have gotten decent jobs and excellent health care in safe, prosperous communities. I've been jobless for months at a time but I've never been homeless or penniless. I’ve been pulled over, taken aside and questioned by authorities, but never arrested. I've worried about my son's well-being, but if he were healthy I'd never worry about his treatment by teachers or about unjust punishment or about his or his father's demise at the hands of a cop or a racist society or a white supremacist terrorist movement. Because we are white we are sheltered from that reality, a reality I'd like to think is not just a part of what it is to be human, but instead, injustice we can change.